I decided, oh, around the beginning of December that I would consider making my Christmas cards this (last) year. The likelihood of them actually going out was very small. For one thing, I’ve never ever mailed Christmas cards. I’ve bought them, yes. I’ve addressed them, yes. I’ve never actually made it to the stamping and mailing part. I stink at snail mail. But this year, I got really into stamping and cardmaking. Add that to the scrapbooking, and it turns out that I LOVE papercrafting. So much. Around the 2nd week in December, I decided to do it. Just do it, SarahK. And I did. I took really crappy pictures of all the cards I made, and I’ll post them later. I made about 80 cards in 2 weeks. I had my cards ready, Christmas letter typed, and address labels printed on December 21. Whatever, by that point, I’d been working through every naptime and from the time baby went to bed until after midnight to just get the silly things done. So they were going out, and I didn’t care if I mailed them on December 26. They were going out. Frank was on board with this, too. He knew I’d been working hard. So I mailed them. And two days later, I got a stack of them returned to me. “Non-machinable.” Since an actual human had to actually touch them, I had to add 20 cents postage to each of them. I cried. I texted Frank and told him I might have a breakdown (DRAMA ALERT!). I was also out of budgeted money for sending cards, so I wasn’t sure where that two dollars was going to come from. Of course, as soon as Frank got my texts, he texted back. “They have to go out. You worked so hard on them. I’ll pay for the extra postage out of my allowance. Whatever it takes.” He’s a sweetie pie. I only got about 10 of the cards back, so I had no idea what happened with the rest of them. I took the returned ones to the post office and saw a person and got them in the mail. Nevermind that an actual person had to touch them the first time to tell me they were non-machinable and then an actual person had to drive them all the way to my house and touch them again, and oh, I could go on, but we’d just end up in a place where I’m ranting about the government’s inability to run anything efficiently, and why do I want them running my retirement account and health insurance again? So I won’t go on. I got more back a day or two later. This time, I went to the post office and used the little automated postage thing to buy the extra postage, and oh yeah, I got a little passive aggressive and paid with my debit card but had the machine run it as credit. You know, so they had to pay the credit card fee. Small, petty victories and all. Oh, I also found out that while most of the cards made it to their destinations safely, at least one that wasn’t returned to me arrived postage due. Hi, Caltechgirl, Merry Christmas, here’s your card that you have to pay for. I hope she put the 20 cents in her mailbox in pennies. Had I not spent two weeks cranking out cards and felt an enormous sense of relief over their completion only to have my calm diminished (ha, you thought I was going to say shattered because of the drama factor), I might try the same thing again this year. Popping them out all at once and all. But I decided to actually get started early this year. Like this week. 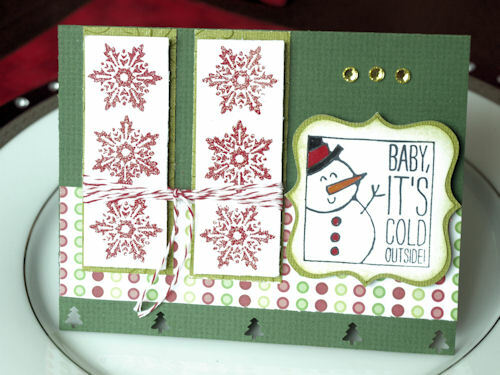 I’ve made three cards already, and I joined the Christmas Cards Challenge over at Splitcoaststampers to keep me accountable. My goal is 10 per month. I did this for Sketch Challenge #368 at Splitcoast and added the twine for Technique Lovers Challenge #360. This entry was posted in paper!. Bookmark the permalink. it was worth the 20 pennies. I LOVE that card and will be upcycling it into some Christmas decor! I love my card, too. And I didn’t have to pay to receive it. WOO HOO! Hopefully you’ll be around for many more years. And more babies, too.